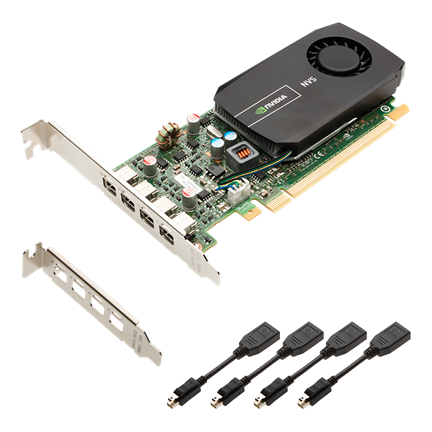 The NVIDIA® NVS™ 510 offers the latest in graphics and display technologies along with industry-leading, multi-display management capabilities in a power-friendly, low-profile form factor. This makes it the ideal graphics solution for professionals who need to efficiently visualize and digest a great deal of information in the financial trading, command and control, and digital-signage markets. Four compact mini DisplayPort connectors with a custom built-in retention mechanism, let the NVIDIA NVS 510 drive ultra-high resolution displays up to 3,840 × 2,160 at 60㎐. Plus, it supports advanced DisplayPort 1.2 features like Multi-Stream Technology and Stream Cloning, which enables efficient cable management, as well as cost-effective multi-display installations. PNY provides unsurpassed service and commitment to its professional graphics customers offering: 3-Year Warranty, pre and post-sales support, dedicated NVS Field Application engineers and direct tech support hotlines. In addition, PNY delivers a complete solution including the appropriate adapters, cables, brackets, driver DVD and documentation to ensure a quick and successful install. All-new NVS 510 display engine drives up to four displays simultaneously and fully supports the next generation Display Port 1.2 standard capable of resolutions such as 3,840 × 2,160 at 60Hz. NVS 510, when used with the NVIEW Desktop Software utility, makes it easy to deploy multiple displays across a desktop or build an expansive digital signage wall. NVS 510's integrated DisplayPort 1.2 Engine produces phenomenal photorealistic image quality while driving ultra-high-resolution panels (up to 3,840 × 2,160 at 60Hz). NVS 510 also supports advanced Display Port 1.2 features like multi-stream technology (MST) and stream cloning, which enable efficient cable management. MST allows an end-user to drive up to for independent displays simultaneously from any one display port output, while stream cloning enables NVS 510 to clone up-to four instances of each display output to drive a maximum of 16 displays. End users can securely connect to the most exhaustive options of display monitors and HDMI capable devices either by using the included mini-DP to Display Port adapters to take advantage of widely deployed DiplayPort cables and dongles, or directly connect using mini DisplayPort based cables and dongles.